Elderberries are one of the UK’s unsung summer fruits, and they can often be found in gardens and hedgerows ready for picking from late summer to autumn. While they’re not that tasty eaten raw, cooking or preserving them will unlock their sweet flavour. Our collection of elderberry recipes tells you just how to do that. One of the best ways to use elderberries is to make them into a syrup or cordial, to make delicious fruity drinks and cocktails (such as this Elderberry Kir Royale). You can also leave the berries to infuse their flavour into spirits – Elderberry gin is particularly tasty. Elderberry vinegar is fantastic for using in salad dressings and sauces, while Elderberry jam is simple to make. 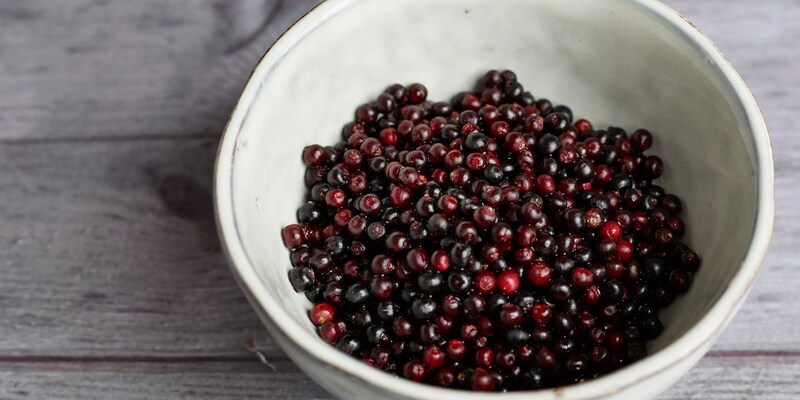 And if you’ve found some elderberries but they’re not quite ripe yet, pick some anyway – you can create Elderberry capers by packing the unripe berries in salt. When cooking with elderberries, always discard the stems as they are slightly toxic. The best way to separate the berries is to run the prongs of a fork through the stems over a bowl.